Just like with any lawn mower, Exmark mower blades will eventually have to be replaced or sharpened. Lawn mower blades require replacing when they get dull or break. This often occurs due to rusting, damage by mowing over rocks or roots, and often just age. Blades in poor condition will cause noticeable tears to the end of the grass blades and height inconsistencies across the area mowed. You’ll want to be sure to use sharp blades because shreds in the grass can lead to fungal problems in your turf. Not to worry though as removing your Exmark mower blades can be done quickly and effectively in just a few steps. To keep the mower operating at top efficiency, you will need to perform regular maintenance, such as checking the blades before or after each mowing to ensure the mower will cut properly. In order to make sure you follow the proper safety guidelines and maintenance procedures, it is always recommended to refer to your owner’s manual for your specific model. For example, Exmark models require unique torque specifications. You can find this information under “Check Mower Blades” in the “Maintenance” section of your owner’s manual. Turn off the mower using the key switch and allow the engine and all mower parts to stop operating. Ensure the mowing lever is in the disengaged position. Remove the key from the ignition switch, engage the parking brake, and pull the wire(s) off the spark plug(s) before you do any maintenance. Also, push the wire(s) aside so it doesn’t accidentally contact the spark plug(s). Adjust the height of the mowing deck to the highest mark, usually the 5-inch level, by moving the cutting-height lever positioned on the side of the mower. This is the same lever used to raise and lower the mowing deck when mowing. In order to raise the front end of your mower easily, we recommend MoJack Mower lifts. Each lift is designed to lift and secure your mower, without having to worry about using ramps or a jack stand. 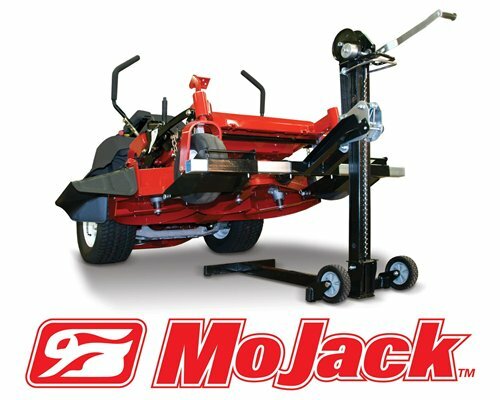 MoJack lifts are adjustable and fit most residential Zero Turn and lawn tractors. Make sure the mower is raised enough so you can adequately see under the mower to remove the blades safely. Place a small block of wood behind the rear tires to prevent any rolling. Loosen the bolt that holds the blade(s) to the shaft using the proper size socket with a long handle ratchet or breaker bar. 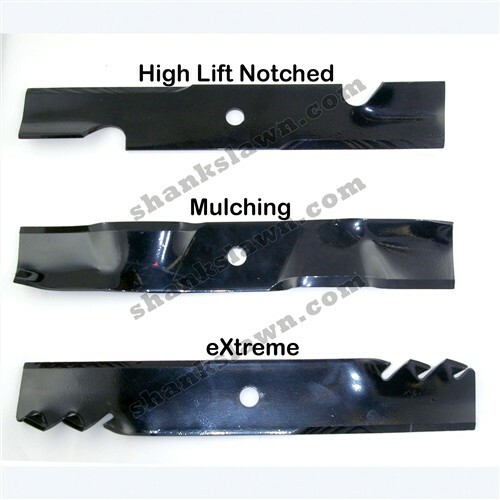 A longer handle allows more leverage to loosen blades bolts that have been torqued to the proper spec. Set the bolt and accompanying washer aside in a safe place, as you will need to reinsert them both later. Investigate the blade(s) for any damage. If the blades are in prime condition, they will have a good clean edge that is simply dull. Broken blades are easy to spot and worn blades might be rusted or simply dull to the touch. Wear gloves and use caution when touching the blades as sharp blades may cause serious lacerations. Replace the blade(s) if necessary by placing the blade(s) on the spindle shaft and then reinserting the washer and bolt onto the shaft. Tighten the bolt to your owner manual’s torque specifications. Ensure everything is secured onto the mowing deck before operating the mower. During maintenance checks, relying solely on mechanical or hydraulic jacks may be dangerous. Such jacks could fail and the unit may fall, which may cause serious injury. Always work smart and with a spotter that can help you if problems do arise. If you’re still having mowing quality problems after the blades are replaced, be sure to check the rest of the mower deck for possible damage. Also, make sure your belts are in good condition and not cracked or damaged. If the belts are slipping poor cut quality will result. Exmark recommends to check your blades and belts before each use. To easily find and purchase Exmark mower blades from a certified Exmark dealer, visit www.shankslawn.com. Since 1984, Shank’s Lawn Equipment has provided thousands of people with the best outdoor power equipment on the market. If you’re in the Chambersburg, PA area or Hagerstown, MD and need service for your Exmark mower, be sure to stop by Shank’s Lawn Equipment. This entry was posted in Uncategorized and tagged Blades, Exmark, How To, MoJack Lifts, Mower, Remove. Bookmark the permalink.